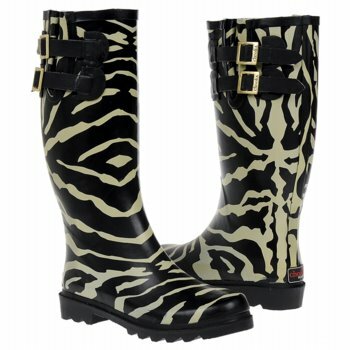 Head out prepared for a rainy day safari in these Urban Zebra rain boots from Chooka. Slick rubber upper in a casual rain boot style with a round plain toe. Brilliant graphic details with tonal trimming. Gusseted collar panel with two slide buckle cinch straps. 12 inch shaft height 14 inch circumference collar. Fabric lining and a memory foam cushioned insole. Rugged boot tread rubber outsole with a 1 inch heel.